A three level apartment located on the top floor of this spectacular Victorian ex hotel building. 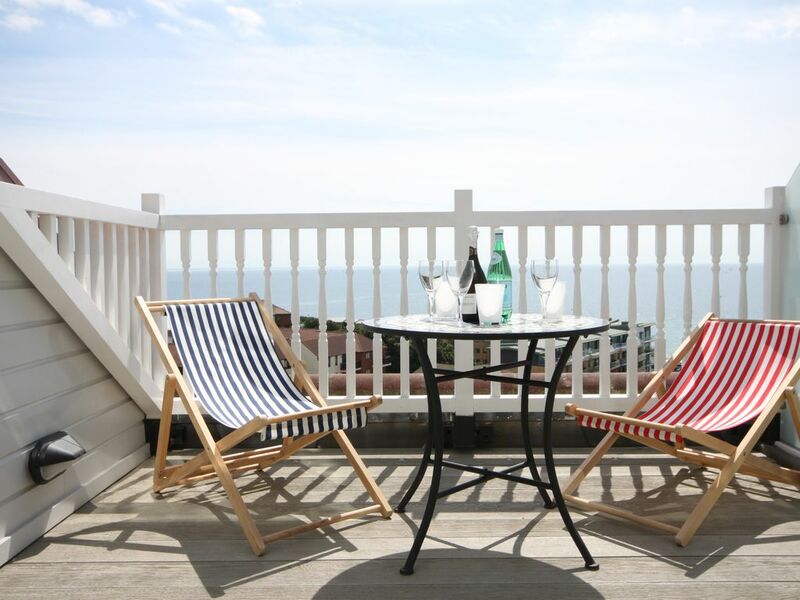 Sun terrace and all amenities 5 minutes to Boscombe pier and beach. Very well equipped with all kitchen appliances, Wi-Fi, Sky TV & BT full packages Sonos music system in principle rooms. Close to shopping and central Bournemouth is 1 mile along the seafront. We welcome families with children, but not toddlers due to stairs. We love being here, and hope you will do too! The views from the balcony and lounge are fantastic. The building is Victorian and oozes grandeur and history as its past incarnation as a hotel. The flat is secure and well looked after by a housekeeper who lives in the block. There is a concierge on site . Spacious penthouse apartment with nice sea view. Lounge on top floor has fantastic dual aspect. Sea view on one side and town on the other. All the mod cons a family could wish for. Modern decor throughout. Would stay here again. My only negative comment would be that one of the shower cubicles is very small and my partner was unable to use. Not a problem for us as sharing accomodation with our children but could be an issue perhaps if two couples staying there. Overall a relaxing weekend with a lovely restaurant within walking distance on seafront. Great location for prom walks in either direction with vey clean sandy beaches. We loved the property. Very comfortable, lovely decked area and great views. Thank you for your comments. We look forward to seeing you again. We had a fantastic stay, it's even better than the photos! Weather was great, TV room is good for watching the sunrise whilst our little boy watches Thomas the tank and the balcony is a little sun trap, even in late November. Great autumn break in Boscombe. Thank you, Matthew, glad you enjoyed your break, we hope you come and stay again soon!